The couple appear to have put their latest drama behind them as they enjoy a sun-drenched trip to Barbados with kids. The pair were seen making the most of the sunshine as they hung out by the pool with their four sons, Kai, nine, Klay, five, Kit, three, and Cass, one. In pap shots, it appeared that Coleen and Wayne both had their weddings rings back on, but in a snap taken by the pool, she appears to have ditched her band. Coleen took to Instagram to share a picture of herself posing up with her "Mummy's boys". 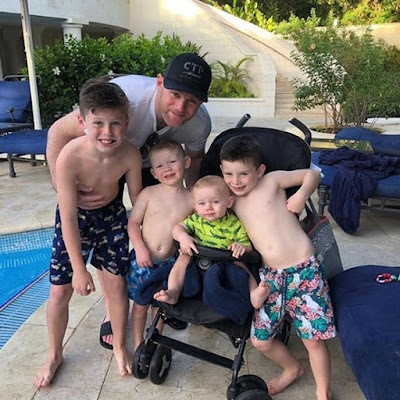 The picture, seemingly taken by Wayne, shows her with little Kit in her arms as Klay and Kai stand on either side of baby Cass in his pushchair. Coleen looks stunning in a green bikini, showing off her golden tan and her stunning figure all at the same time. Wayne posted a similar picture to his own Instagram account. Swapping places with Coleen, he stood behind his boys, crouching down to get in the mix. Godo to see them this way!